Well, during my last trip to Delhi with my parents, a must visit in our list was this place called the Gandhi Smriti also called the Birla House. There wouldn’t be a person in this world who doesn’t know Gandhiji I guess!!! That’s just a guess. Might be someone in one corner of the world may not know, still!!! When he was alive, one fifth of the then world population was following him – a man who wouldn’t even wear a shirt, leave alone getting groomed properly. I dare not say that I’m a Gandhian or his follower. I look up to him as a teacher, a guide, a philosopher, a designer (Till date, he’s the face of Khadi Fabric!!! ), a simple man who I still, badly wanna meet in flesh and blood and be beside him as a friend. I am an aspiring follower of Gandhiji and I try whatever is possible. Whatever he did was in such a level that I may not be able to achieve unless I try really hard. He was not flawless. But the best part of him was accepting his flaws, which not many have the guts to do!!! Being a Gandhian is not just a part of living, it is rather the way of living, a complete transformation!!! Well, it was really hard to even think about his death. 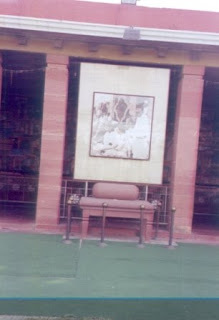 But Birla House in Delhi was the very place where he lived his last 144 days and lost his life on the unfateful day on Jan 30, 1948, which was less than 6 months after India’s independence. 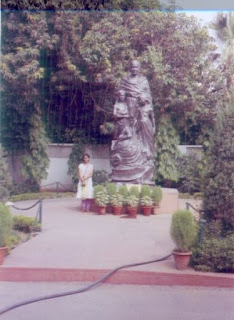 The entrance of the Birla House which is now called Gandhi Smriti, has this huge statue of Gandhiji with children around him. This is his room. 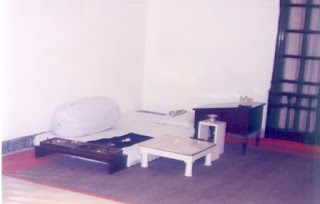 The exit door of his room from where he comes out to reach his seat everyday for the meeting and prayers. That is his seat. From the room he should have reached this seat. But enroute, at this very point, 3 bullets from Nathuram Godse, hit him right on the chest, that made him speak out ‘Hey Ram’ and he fell a prey to those bullets. This place is has a museum that stores some of the stuff that he used. 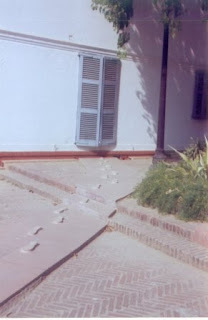 Many of the original stuff that he used including his specs, footwear, walking stick etc are kept in Southern India in the Gandhi Museum at Madurai. This Museum is in my list of ‘must see asap’!!! What makes a small town in Southern India to be chosen to keep Gandhiji’s belongings. Coz, this was the very place where he decided he wouldn’t wear the shirt and settled with the loin cloth clad look. Coming back to Gandhi Smrithi, the museum here has some of the original stuff that he used though not all. Good things are always hand in hand right? So here is a stall where you can buy some little things including some confectionaries, table clothes, napkins, embroidered hankies etc. So what do these things have to do with Gandhi Smriti. There is a relationship. I told you good things go hand in hand. These products were made by the inmates of the Tihar Jail. Tihar Jail is one of the most popular jails in India in a good sense. Anyone who knows about IPS Officer Kiran Bedi must know about Tihar Jail as well. Located in New Delhi, this jail was completely transformed under the control of Officer Kiran Bedi, who made a point to convert the inmates of the jail as responsible citizens of India by training them in some work or the other. Making these confectionaries, hanky embroideries are all a part of it. So whatever is sold is their money which is kept in account under the warden. This money is given to them during their release which boosts their morale in leading a proper life after coming out of the jail. Now its no more called the Tihar Jail, its now called the Tihar Ashram. I’m sure Gandhiji would be smiling from the heavens at Kiran Bedi. Its located in a lane called Tees January Marg which means the 30th January Place in New Delhi. Roadways: Autos and cabs can take you there from anywhere within Delhi in nominal charges. Beautiful shots of the place. Good to know about a place that I did not know before. Thats a beautiful coverage of Birla House. 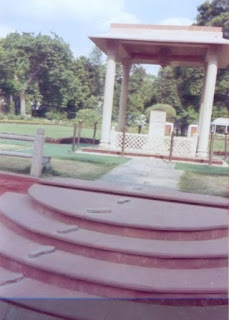 I have been to this place and the Gandhi Asharam in Ahmedbad. The places emote his principles. There is unique aura around them and which is so clearly seen in these pictures! Nice post! I have been there as well but had no photos of the place. Gandhiji was inspirational indeed, wish the World was a more peaceful place as he had envisioned it to be. Our National disconnect is evident in actions of people and politicians in India these days, its anything but Gandhian unfortunately. Ghandi was a wonderful man who lived a simple life while thinking great thoughts and serving his people to the best of his ability. I admire him greatly. Thanks for teaching more about his life and death in this post. Really!!! Its a place where you can feel the vibe of his principles!!! Wish we were more Gandhain in our words and deeds!! !